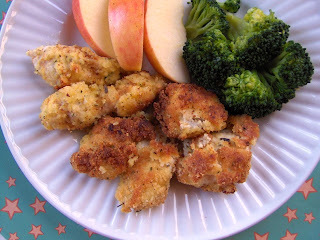 My five year old is a stickler for kid food and luckily there are many SCD blogs with lots of kid friendly recipes. It's great to see more and more SCD blogs popping up. I especially like Sherry's "Specific Carbohydrate Diet for Life" blog where I found this recipe for Crispy Chicken Nuggets. These were delicious, easy to make, and passed the kid test. I added a teaspoon of Herbs de Provence to the almond flour, but any spice would work well. Thanks Sherry! 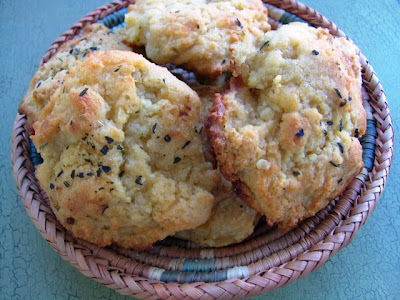 What do you get when you cross Elana Amsterdam's Classic Drop Biscuits with Red Lobster's Garlic Rolls? You get this yummy hybrid that goes great with a hot bowl of your favorite soup. This recipe was adapted from Elana's "The Gluten-Free Almond Flour Cookbook". This recipe was originally posted over a year ago and much to my horror I realized I had forgotten something, so I stuck the recipe in my draft folder and forgot about it until today. We were craving these so I made a batch and have fixed the post. I apologize to anyone who had made the older version and was disappointed. This post is linked to "Grain-Free Tuesdays" at HellaD's. Oven 350 Degrees. Line a large cookie sheet with parchment paper. I use an aluminum cookie sheet which keeps the bottoms from burning as quickly. If your using a darker type metal pan you may need a slightly lower temperature. Mix almond flour, salt and baking soda in a large mixing bowl. In a small bowl combine oil, yogurt, eggs and lemon juice. Lightly beat with a fork. Stir into flour mixture until combined. Stir in shredded cheese. If you like your rolls very garlicky, add garlic now. Drop dough by about 1/4 cup portions onto cookie sheet. Add garlic to butter and combine (if you haven't already put the garlic in the dough). With a pastry brush, brush the tops of the rolls with the melted butter. Sprinkle with a small amount of dried parsley, basil or oregano. Bake about 15 to 20 minutes until lightly golden. Out of the mouth of babes. Here is a link to a speech from an eleven year old about the status of our food system. 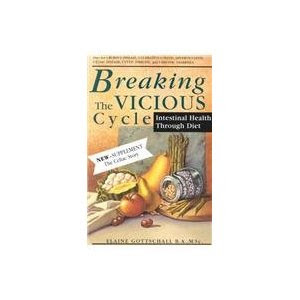 If you're a fan of Weston Price, Michael Pollan or Food Inc., then you'll love this. Jane Casey sent me this link. Thanks Jane! This post is linked to Grain-Free Tuesdays at HellaD. 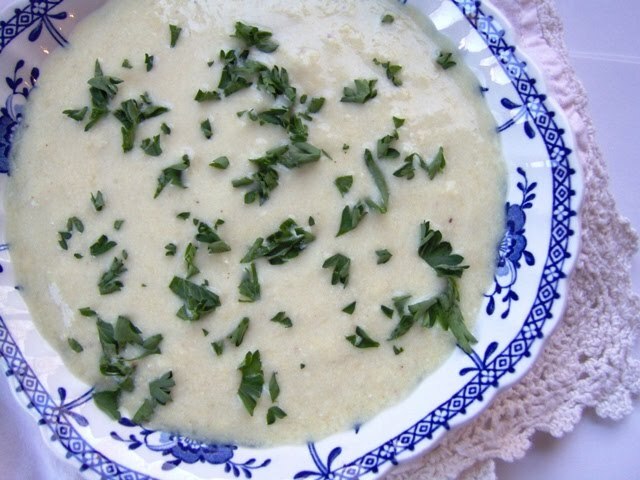 A creamy soup with artichokes, Parmesan cheese and garlic...how could you go wrong? This was adapted from the "New England Soup Factory Cookbook" by Marjorie Druker. Instead of using cream, I use yogurt cream, homemade yogurt made from half and half and when processed for 24 hours it is virtually lactose-free. I also use canned artichokes, but you could use frozen ones as well. This is my submission for this months "Go Ahead Honey It's Gluten-Free". Linda of The Gluten-free Homemaker is hosting and the theme is "Seasonal Soups". Funny, artichokes are always in season in my pantry, so this was a natural choice. It it also quick and easy, another seasonal favorite! This post is also linked to "Grain-Free Tuesdays" at Hella Delicious, and "Slightly Indulgent Tuesdays" at Simply Sugar and Gluten-Free. In a large pot simmer chicken stock, artichokes and garlic a few minutes, until artichokes are fork tender. Use an immersion blender to puree or use a regular blender and puree small batches at a time. Return to pot. Add nutmeg and cheese. Stir until cheese is incorporated. Season. Remove from heat and stir in yogurt cream. Garnish and serve. The Gottschall Autism Center is having their second annual "When the Belly is the Beast" conference on Friday, April 1, 2011. What caught my eye was Dr. Allessio Fasano will be speaking on "Gluten, Leaky Gut, and the Autism Spectrum Disorder: How to Connect the Dots". Dr. Fasano has done some really fascinating research on the role of intestinal permeability "leaky gut" and autoimmunity. I was excited to see another researcher of this caliber looking into the autism and gut connection. Dr. Martha Herbert, a pediatric neurologist from Harvard will also be speaking. Oh to be a fly on the wall at this conference....way too cool!